On Friday 8 June, to celebrate World Oceans Day, Project Seagrass launched the global version of their Seagrass Spotter app – available online at www.seagrassspotter.org. Project Seagrass are one of the technical partner organisations behind the Dugong and Seagrass Research Toolkit. You can read more about the global version of SeagrassSpotter in the Press Release below. Our oceans are in deep trouble and we need to find solutions for them fast. As people across the planet come together to celebrate and honour the ocean on World Oceans Day we hope they can be inspired into action and becoming part of these solutions. Marine habitat and species loss is widespread, problems of climate change and pollution are increasing, and there’s an increasing tide of plastic in our seas. We need to rapidly change the course for our beleaguered oceans. Seagrass meadows are one such habitat that are under widespread threat, with loss rates estimated at approximately 7% per year. To turn the tide of despair we need to find solutions that bring a sense of optimism for the future of our blue planet. One formidable solution for our oceans is to crowdsource conservation by using an army of marine conservation volunteers who can help collect much needed data and contribute to conservation actions. This is the desire of developing a new global marine conservation project www.SeagrassSpotter.org. To celebrate World Oceans Day at Project Seagrass we are releasing the global version of the Citizen Science project www.SeagrassSpotter.org. 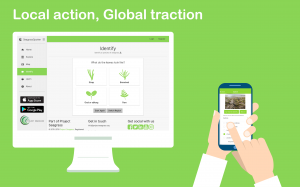 This website and phone app allows ordinary people from all around the world to help us understand and conserve globally important seagrass meadows. The new global version of SeagrassSpotter.org is an important upgrade as it now includes the first global easy to use identification guide for seagrasses. Simply put, a user can take photo of intertidal seagrass using the app, or upload a picture taken with any camera direct to the website. The user will then be asked to identify and describe what they’ve seen. This information is critical for understanding the health of these systems around the world. We’re asking people visiting the coast or going out to sea (for diving, snorkelling, fishing, kayaking) to keep their eyes out for seagrass so that they can take a picture for upload to our website. Seagrass are flowering plants adapted to life in the ocean. The more people that get involved the greater an appreciation is developed for seagrass and the more likely we are to develop a better understanding of these important resources around the world. Understanding where seagrass is and mapping its distribution is an important part of conserving it and preventing its loss. Creating large scale conservation projects for protecting resources, such as the carbon stored in sediments or the fisheries habitat provision requires knowledge of where seagrass is. To date the world has mapped around 300,000 km2 of seagrass but experts have speculated that there could be up to 4 million km2 of seagrass. Research this week has confirmed the value of these meadows in supporting world fisheries production and the need to put more effort into their conservation. There is no easier way for people around the world to help protect seagrass than by getting involved with the collection of information about this precious resource. To date SeagrassSpotter has collected over 1000 records of seagrass around the UK and northern Europe, but at Project Seagrass we now hope to make this success global and in particular we’d like to receive new records from across SE Asia where seagrass mostly poorly mapped. We’d also like to improve our understanding of key locations that are also inadequately mapped such as the seagrasses of the Indo-Pacific region. We hope to obtain at least 100,000 records by engaging people from all around the world to collect data about seagrass in their locality. Dugong and Seagrass Research Toolkit featured at ISBW! The World Seagrass Conference and International Seagrass Biology Workshop 13 (ISBW 13) took place from 11 – 17 June 2018. During the conference, Dr Himansu Das from the Environment Agency – Abu Dhabi gave a short presentation on the Dugong and Seagrass Research Toolkit, and how it can be used to inform seagrass research. If you are at ISBW 13 don’t forget to say hello to the Toolkit team! You can find out more about them on the ‘Partners’ and ‘Experts’ page of this website. We are looking to compile some case studies so please send us any experience you’ve had. To sign-up to our newsletter please click here to send us an email.